It should be mentioned that many advertisements from this era were very politically incorrect. I’ve excluded such ads from this list as I feel it would draw the attention away from these particular selections. Though it may be the subject of a future post. 245 Responses to This Post. Leave Your Own. i love this site, what a collection. thanks. I stumbled on this, and what a find! Some great work, some poignant reminders of how fast the world has been transformed by technology in the past 60 years. Thanks. These ads are inspiring, telling us as much about ourselves as about the products. Fascinating look back over our history. I like the AC spark plugs ad – the others were cool as well. I Love Too Look At All The Vintage Goodies. Some of them are strangely ironic. this is my first time seeing beautiful vintage ads. i probably too fed up with more popular scary vintage ads. Love it! Smirnoff was fantastic – “Come out of your shell” that just cracks me up! that’s Woody right? Appalling apostrophe confusion in that International Harvester ad. nice! especially the smirnoff ad with woody allen!! LOVE THESE! Great work compiling. Only one thing I wish that could have been included is the year the ads ran. Now that would have been really interesting – though probably difficult to get. Its just amazing to see how sophisticated advertising has become over the years. I love that most of the messages in the ads were less than 140 characters!! Ouija Board is my favourite – kinda creepy but hilarious at the same time. Advertising is not what it used to be. The most fascinating thing is that they even advertised for Ouija boards. I’m trying to figure out what the lady in the mink is doing with that poor monkey! Maybe sizing him up for her next jacket?! That electrician only made $8,500 a year?!?! That carpet must have only been like 5 bucks to install then! sweet stuff!! i actually had a pair of the green striped levi flares!! a lot of these ads feel like they were in playboys!! 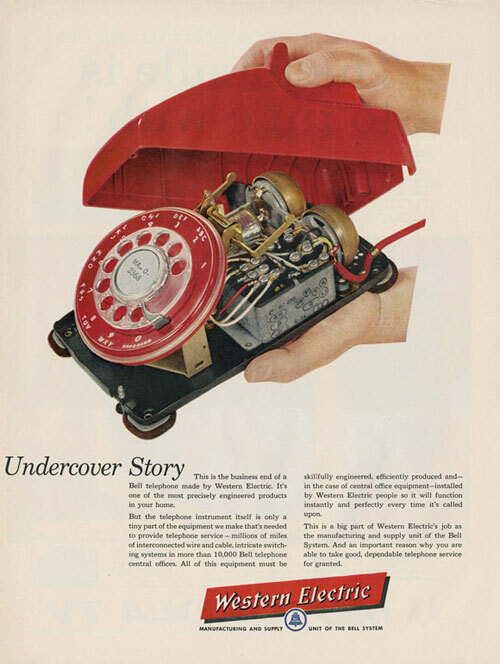 Amazing collection of vintage ads, Western Electric picturephone I like the most! Reminds me of simpler times, when an ad could be knocked out in a morning, you charged two months salary for it and spent the afternoon in the bar telling each other how great you were and how lucky the client was!